Durham City Councilman Eugene Brown has released a comprehensive list of questions that would provide excellent guidance to any outside inquiry into the DPD. As he notes, they all relate to an overarching theme: "Why did three Durham residents have to go to Raleigh and the Attorney General's office to get justice?" "Is the Durham Police Department proud of its role in the Duke Lacrosse case? If so, what does DPD feel went right with the case?" Bell: "(The panel)...is to review documents, interview or take testimony from participants on both sides of the prosecution and perform such other tasks as it deems necessary or appropriate." This committee has potential. Especially since laxer defense attorneys have the opportunity to participate, if I'm reading that correctly. I doubt that those laxer attorneys will dealing with generalities, but will get into specific misconduct by Gottleib and other DPD officers. It could get nasty enough to cause some to lose their jobs, an outcome worth the effort itself. It's a forum that will bridge the gap between Nifong's disbarment and the start of the civil trials, if any. It'll keep the case in the newspapers. I'll let the actions of the laxer attorneys tell me whether this is a sham that some armchair QBs are calling it already. If they decline to participate, or badmouth it, I'll be persuaded. 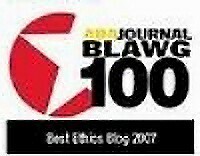 This guy reads the blogs. He could have made a much longer list of questions too. Mr Brown: Will the Durham council require their DPD employees to answer all panel questions as a condition of future employment? I doubt anyone in Durham Admin is going to the blogs for questions. That is a fanasty. I knew everyone did all they could to help these guys, but we are not defense lawyers. Have phone - will call. What is the law? Can the Major put a stipulation that "future employment requires answering a question/" What do the legal folk think? ...Who was driving the train and who was stoking the coal in the fire engine to keep this hoax of an investigation going? At least we know now that someone knows about the hoax? What about the retired Judge as head of the investigation? Two things that stand out--the intimidation of the witness and Gottlieb's notes. Those are serious serious no-nos. I am still a bit skeptical about an inquiry. In order to have some degree of legitamacy, those doing the inquiry need to have subpoena power and the ability to put people under oath. In addition, if crimes were commited (or reasonably thought to have been), that needs to be referred to the AG or the USDOJ for further investigation or prosecution. In essence, Councilman Brown is reposing a question which has already been answered in the statement of the Durham City Manager - that the official conduct of the DPD/DA in this case was "typical." So, we're not talking rocket science here, although the ongoing political machinations would make it seem so. Welcome - belatedly, Mr Brown. It took you a while, welcome to the side of justice. They must be having a good time now counting down the days to testifying at Nifong's hearing. They know that Meehan will finger Himen, Gottieb and Nifong in hiding the DNA evidence. That after learning of a major problem with the FA story they never questioned her, but instead hid the DNA evidence. The bar lawyers will ask all three about how they went on to a grand jury, once for the 1st two players and then a month later for a 3rd player when they had proof that the FA was lying. Wilson needs a really good story to explain that Dec FA story change. No way Nifong shows up at the hearing. If he is stupid. This is just discovery for future lawsuits and criminal investigations. I think Gottlieb's notes and his filming the "line up" was his way of covering himself. He was signaling " Don't believe this stuff." He is a SGT and a smart guy. He knows how to CYA. He was abandoned by his Superiors when he was told to follow Nifongs lead and ignore the law. Either you are the Sgt. himself or his best friend. If the Sgt. is so "smart", he would never have conspired to obstruct justice in the first place. The fact that his notes are so late in coming and clearly fabricated, it's not going to help him in a civil suit, he will get toasted. The late notes are bad enough but, he was at the meetings with Meehan. Active participant in the DNA criminal cover up. He will be there - The fonger still thinks he is smarter than anyone else and the South's greatest lawyer. it is going to turn out he is as delusional as Crystal. No civil suits except maybe Durham. The civil suits are delusional also. Everyone is being crucified except Meeham, who entered into a conspiracy with Nifong. The fonger still thinks he is smarter than anyone else. True, but by now his lawyer and everyone else's lawyer must be telling him he's nuts to get more information on the record. What happens if the DPD and Wilson take the 5th at the hearing? What are the laws concerning civil service employees? Is the 5th even an option? I am neither the SGT or his best friend. I may be the only person here, who ever held a job. I find many bloggers playing fast and loose with other people's paycheck and employment. What other's should have done to destroy their livelihood, is always easy, when it comes from peole not involved. No conspiracy has been proven except Meeham's testimony 12/15. Mr. Brown, you have a lovely blotter. No conspiracy has been proven except Meeham's testimony 12/15. The SGT G. and Himan detectives were in the room and amazingly the DNA evidence never was recorded in their notes. Nifong is an egomaniac and crazy - stupid, I am not so sure. No way would he discuss this with Meeham in front of the cops. Meeham never mentioned the cops as part of the conspiracy - only Nifong. We have no way of knowing, whether the coppers were in the room the whole time. I don't think they were. The two lead detectives on the case, met with Meehan after driving over an hour to get there with Nifong. They ask if the DNA matched the suspects DNA (answer is yes or no). They now know that DNA (Y (male)) was sent to be tested and did not match the players. Anyway Meehan and the Detectives are scheduled for the June hearing. "I am neither the SGT or his best friend. I may be the only person here, who ever held a job. I find many bloggers playing fast and loose with other people's paycheck and employment. What other's should have done to destroy their livelihood, is always easy, when it comes from peole not involved. ..."
Ah, yes, 12:17 is definitely Gottlieb. Who else in the whole of the world would compare a police officer's willing complicity in a frame-up that threatens to send three innocent young men to prison for decades for a "crime" that never occurred, with a blogger exposing that complicity, and think the latter is the worse of the two? Cry me a river, Sergeant. You'll be luckier than you deserve to lose only your "paycheck and employment" over this; what you should lose is your liberty for the next 30 years. After all, that's what you were corruptly conspiring to deprive Evans, Finnerty and Seligmann of. Be very cautious about Eugene Brown. I remember when all this started, my take was it was because he and Nifong were friends. He had been very vocal in the past about the loud parties and noise from the Duke students. He may speak the right words now, but in my opinion, he's not to be trusted. Councilman Brown gave an excellent list of questions, and, as he is PART of the city oversight and leadership above DPD, his list of questions has a good likelihood of being part of the questions formally posed to DPD. ...Be very cautious about Eugene Brown. I remember when all this started, my take was it was because he and Nifong were friends. He had been very vocal in the past about the loud parties and noise from the Duke students. He may speak the right words now, but in my opinion, he's not to be trusted. You bring up a good subject to discuss. Noise from students. Over the years I have worked with many families who are neighbors of the private university where I worked. The #1 annoyance complaint that got us to move quickly was noise that kept families awake during the night. Especially children. All students including athletes, fraternity members and sorority members were told eye-to-eye not to ever... keep a family awake in the nighttime. If you are charged with a noise violation that includes keeping a family awake...we CAN NOT help you with the police. Any university with families living close to students must give this type of instruction to students. If not...the university is just enabling the students to get into trouble. 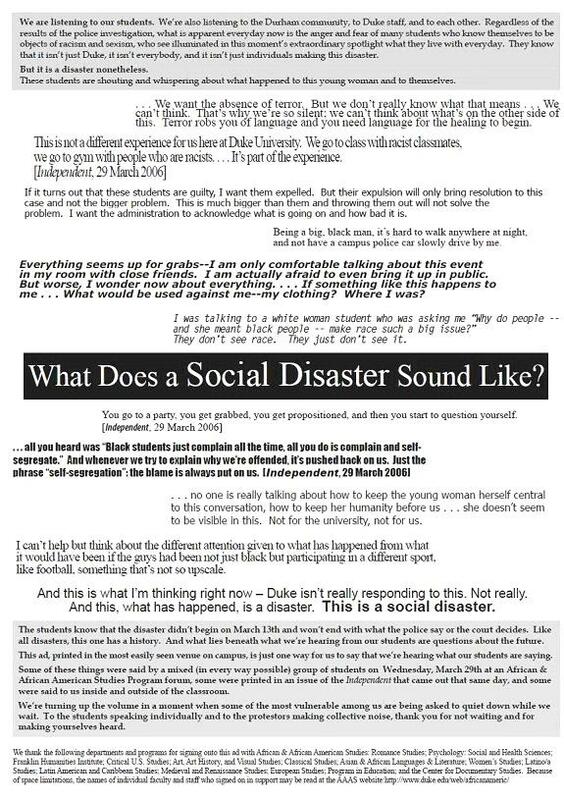 We read over and over about noisy Duke students in the Durham neighborhoods. Mostly athletes. Seems to me that someone on campus was just waiting for them to get into trouble. With so many of the Duke students drinking so much, they will get in trouble. It is a matter of when. who ask that charges be brought. indemnifies the City of Durh.